Claire Askew – in her own words, “a writer, community educator and intersectional feminist. She’s about to complete a ranty feminist PhD in Creative Writing and Contemporary Women’s Poetry with the University of Edinburgh. Claire has won numerous accolades for her written work, including, most recently, a Scottish Book Trust New Writers Award and the inaugural International Salt Prize for Poetry. She works as a lecturer in Further Education and also with women’s groups like Edinburgh’s Women Supporting Women and Scottish Women’s Aid. Claire lives in Edinburgh, collects manual typewriters and blogs regularly at onenightstanzas.com“. 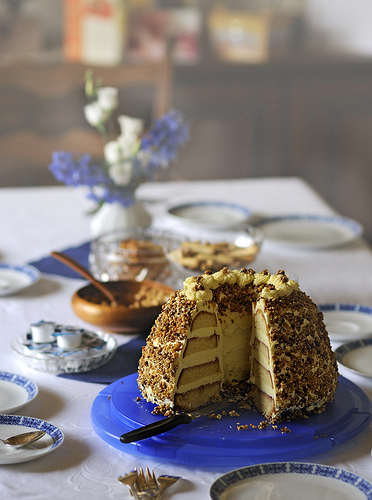 Image shows a Frankfurter Kranz, a delicious German cake similar to a Victoria sponge. Used under a Creative Commons licence, with thanks to tiegeltuf. …And yes please, I would love a piece of that cake!